I am a cartoonist who works primarily in the field of nonfiction comics, specifically as a comics journalist. I’m the writer/artist of the Eisner and Harvey Award-nominated A.D.: New Orleans After the Deluge, and the Xeric Award-winning graphic travelogue A Few Perfect Hours (and Other Stories from Southeast Asia & Central Europe). I am the illustrator of the New York Times bestseller The Influencing Machine: Brook Gladstone On the Media. I was a longtime artist for Harvey Pekar’s American Splendor, and my art has been exhibited in gallery and museum shows in the United States and Europe. Though born in New York, I have lived in San Diego; San Francisco; Chicago; Oberlin, Ohio; Provincetown, Massachusetts; the Canadian cities of Halifax and Vancouver; and in London and Prague. I currently live in Ann Brooklyn, New York. I’m married to the beautiful and brilliant writer Sari Wilson, and we have a delightful daughter named Phoebe. How long have you been drawing comics? Who are your influences? I’ve been drawing “seriously” siince I was four years old. My earliest influences were Hergé’s Tintin and Curt Swan & Murphy Anderson’s Superman. I moved around a lot as a kid, and one way I kept myself entertained — and grounded — was by drawing. I still have copies of the comics I drew as a kid — most of which were blatant ripoffs of Tintin and Superman! Now that I’m a bit older, it’s real stories that interest me most, and I try to use the comics form to explore “unconventional” subjects. Cartoonist Joe Sacco, and comics writers Harvey Pekar and David Greenberger have strongly influenced me in that regard. Sacco’s work showed me that comics journalism was a powerful tool, and Pekar and Greenberger taught me to treasure the strangeness of real life and appreciate the little details of daily existence. 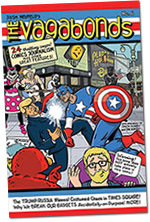 I went to high school at Music & Art in New York City (now called LaGuardia), where I drew comics with a large group of aspiring cartoonists (including my fellow professional Dean Haspiel). I spent a semester of my junior year of college studying the History of Art at University College, London; I earned my BA in Art History from Oberlin College. As a 2012–2013 Knight-Wallace Fellow in journalism, I took courses at the University of Michigan. Not counting some unfortunate early forays into the superhero genre, my first professional work was a page in DC/Paradox Press’s The Big Book of Urban Legends. After that, I had the honor and intense pleasure of illustrating Pekar’s stories in American Splendor and Greenberger’s stories in Duplex Planet Illustrated. I was a regular illustrator of Pekar’s for almost fifteen years. Was Harvey Pekar as quirky and irascible as the character played by Paul Giamatti in the American Splendor movie? Yes! And I loved him for it. I’ve done a lot of self-publishing. Around the same time as I was starting to illustrate for Greenberger and Pekar, Dean Haspiel and I co-created Keyhole Mini-Comics, where we experimented with our own writing, as well as publishing the work of some of our friends. Later, Keyhole was converted to a full-size comic, published by Millennium Publications and Top Shelf Comics. (While published by Millennium, Dean and I did all the design, production, and marketing of the book, so I sometimes count that as self-publishing.) It was in Keyhole that I first started illustrating my travel adventures and that Titans of Finance made its first appearance. In 2004, I was awarded a Xeric Prize to self-publish my collected travel adventures in A Few Perfect Hours (and Other Stories From Southeast Asia & Central Europe). And in 2006, I self-published Katrina Came Calling, about volunteering with the American Red Cross after Hurricane Katrina. In 2014 I joined Dean Haspiel, Gregory Benton, and (now, alas, the late) Seth Kushner in Hang Dai Editions, where we publish signature creator-owned works that we self-distribute, primarily through comic festival and conventions. How did A.D: New Orleans After the Deluge come about? Are you from New Orleans? I’m not from New Orleans, though I first visited the city in 2003. Then, after Hurricane Katrina, I volunteered with the American Red Cross. In October 2005, shortly after the hurricane, I was deployed to Biloxi, MS, where I worked for three weeks as a disaster response worker. In 2006, I self-published Katrina Came Calling, a collection of my blog entries (and the resulting comments) about volunteering with the Red Cross. K.C.C. 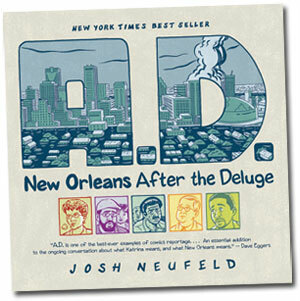 led to A.D.: New Orleans After the Deluge, a graphic novel(ization) of the stories of six real New Orleans residents and their encounters with Hurricane Katrina. A.D. was originally serialized on SMITH Magazine. In 2009, Pantheon Books published an expanded hardcover edition of A.D., which became a New York Times best-seller. The paperback edition of A.D. was released in August 2010, right before the fifth anniversary of Katrina. A.D. has subsequently been translated into French and Dutch. Is all your work nonfiction? Pretty much. Keyhole Mini-Comics was my first foray into writing comics, and making something up didn’t come easy to me. It did seem natural, however, to combine my love of the Tintin adventures with my own real-life travel experiences, particularly the “adventures” I shared with my then girlfriend (now wife), during the year we spent backpacking around the world. I relate those tales in A Few Perfect Hours. Working with journalist R. Walker, I illustrated Titans of Finance: True Tales of Money & Business, a collection of satirical comics about real-life business moguls. Titans was published by Alternative Comics in 2001; a color version was produced for the tablet in 2010. I also collaborated with NPR’s On The Media co-host Brooke Gladstone on the bestselling The Influencing Machine. It has been described as “McLuhan meets Spiegelman.” The book examines media’s past and future, and its effects on society. The hardcover was published by W.W. Norton in May 2011, became a New York Times bestsller, and has also been released in paperback format. The Influencing Machine has been translated into four languages. In 2012 I was awarded a Knight-Wallace Fellowship in Journalism from the University of Michigan. I spent the 2012–2013 academic year at the University of Michigan honing my craft, learning from my fellow journalists, and rubbing elbows with top academics, political figures, and media professionals. As a group, we also visited Brazil, Argentina, Turkey, and northern Canada. I’ve also been an Atlantic Center for the Arts Master Artist, a Xeric Award recipient, an Eisner Award and Harvey Award nominee (for A.D.), and an Ignatz Award nominee (for Keyhole). I’ve been part of the Speaker/Specialist program of the U.S. State Department, which sends artists, writers, and the like to foreign locales to present their work and represent American culture. In that capacity I have visited Burma (Myanmar), Egypt, Algeria, Bahrain, and Israel/Palestine; I’ve also done a “virtual” visit to Jakarta, Indonesia. What was your involvement with the ABC News special Earth 2100? I co-wrote (with my wife, the writer Sari Wilson) the “motion comics” element of Earth 2100, which looked at the speculative effects of global climate change. Looking back from the year 2100, our character Lucy tells of a California under siege from wildfires and apocalyptic cults, a drought-starved Mad Max-esque Midwest teeming with bandits and mercenaries, and a flooded New York City with streets like Venetian canals. Our work on Earth 2100 led me and Sari to create the motion comics studio Dojo Graphics. We specialize in original graphic narratives for print, online, and TV, often with an educational focus. Clients include ABC, Lifetime, Scholastic, AT&T, and the City University of New York. I’m the creator of the ongoing, occasionally published Alternative Comics series The Vagabonds. I have contributed to anthologies published by (among others) Vertigo, Fantagraphics, Dark Horse, Top Shelf, StripBurger, and SPX. My comics and strips have also appeared in daily newspapers, alternative weeklies, financial magazines, literary journals, museum exhibition catalogs, and many other venues. Check out my comixography for a full list.